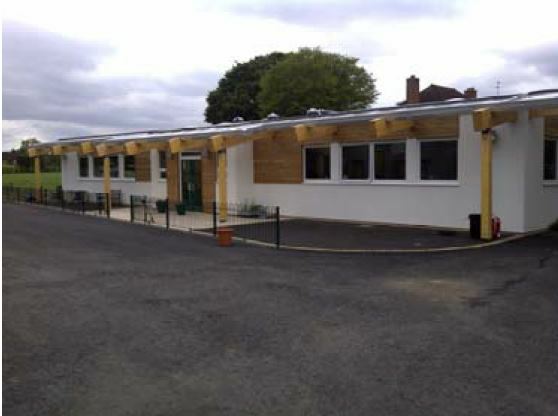 In association with Gifford consultants and J & B Hopkins Ltd, Ashley School are enjoying the benefits of a bespoke hybrid heating and hot water system in a new early years building. The bespoke hybrid system consist of a single ThermiStar L 28kW air to water heat pump, two SolarMat CPC14 evacuated tube solar collectors, two 47kW ProCon gas condensing boilers, a single 450 L thermal store/hot water pre-heater and a single 305L unvented calorifier. Control of the various heat sources in managed by the RVS Siemens controllers supplied as standard within the ThermiStar and ProCon range. Following an initial meeting with the client a bespoke hydraulic design was developed in association Gifford consulting. The installation of the system was undertaken by J & B Hopkins. The flexible nature of the control system allowed the ProCon boilers to be commissioned prior to other components to assist with building drying. Following the commissioning of the complete system by MHG engineers, both the teachers and pupils are enjoying the benefits of a newly installed hybrid heating system.